Join the Guild to celebrate the 2018-2019 year with wonderful evening at the Guild Appreciation Dinner provided by the Heard Museum in honor of all the hours of service that we have given. New officers will be installed as well as many Awards will be given out to many worthy volunteers. The new Las Guias graduates will be introduced by Education Coordinators Maryann Fast and Don Montrey. Please join us in celebrating a very successful, eventful and exciting Guild year. The Nominating Committee would like to announce the slate of officers to be presented for the 2019-2020 Guild year. Election will be at the April Guild Meeting. Richard Borgmann, President-Elect, has agreed to stand for election as Treasurer. Accordingly, Jane Przeslica will stand for election as President-Elect. Don Montrey will remain as the Nominating Chair. The Heard Museum Staff is appreciating YOU at our annual Guild Appreciation Dinner. We hope you’ll join us as we express our deepest gratitude for the many hours of service you have rendered the museum over the past year. The evening will also include the installation of the Guild Board officers, presentation of the Las Guias class and presentation of Guild Service awards. Appetizers and a buffet dinner will be included in the festivities. With heartfelt thanks, we look forward to celebrating with you! ——you may pay by credit card or check at the April Guild meeting. Yes, folks, we are already planning the 62nd Heard Museum Guild Indian Fair & Market scheduled for March 7-8, 2020. Do you want to meet people and get more involved in Guild activities? Taking a lead role in the Indian Fair & Market or serving as a team member is a fun and rewarding way to meet Guild members, artists, staff and visitors. I didn’t know anyone when I joined the Guild. I came to the monthly meetings, but I wasn’t a docent or in the Las Guias class so I didn’t have a an easy avenue for meeting people. Getting involved in the Fair opened the floodgate to new people and new experiences. I regularly learn something new about indigenous arts and cultures, the Guild and the museum. I’ve also acquired some WordPress/website skills, written press releases, learned more about fundraising, worked on magazine issues from planning to distribution, organized live TV spots and lots more! Jump in! Many Guild members have served on multiple committees, so people are available to advise and assist. Someone will always have your back. Generally, we need people with good organizational skills and the ability to coordinate and collaborate with others. Some tasks require specific computer skills (e.g., word processing, Excel spreadsheets, WordPress for the website, Access for the database) while others are more dependent on strong people skills or logistical planning skills. Some jobs are more time and labor intensive than others. Some require frequent presence at the Heard and some can be done mostly from any location. Opportunities are available for Team Leads (aka Committee Chairs) and Co-Chairs, Shadows (learn from an existing Team Lead) for Fair 2020 with a commitment to Chair for Fair 2021), and team members as well as task-related volunteers (e.g., envelope stuffing parties). Areas where we need Team Leads or Shadows, include: Admissions, ASK ME/Information Booths, Fundraising for Juried Competition Award Ribbons, Food & Beverage vendors and booths, Juried Competition-Recruiting Judges, Artist Hospitality, and Marketing (WordPress/website, social media, materials distribution, writing, planning, designing) and Staging. Email, call or text me, Anna Flynn, so we can chat about your talents, skills and interests. Email: fairchair@heardguild.org or call or text: 928.899.6073. We will meet on Tuesday April 23rd at 9:50 at the Cave Creek Museum 6140 Skyline Drive, Cave Creek 85331. There will be a docent explanation of the archeological section. In addition, just for us the museum will fire up the full-sized stamp mill that has been reconstructed on site. This will be at the start of the tour:10AM. This giant machine was used to break large rocks into small gravel so that minerals could be extracted. After the tour we will have lunch at the popular Horney Toad in Cave Creek, just a five-minute drive from the museum. The museum entrance cost is 4 dollars. Please send a check made out to Kurt Kahlenbeck by April 17th so I can make final reservations. My address is: Kurt Kahlenbeck 1235 N. Sunnyvale #27 Mesa, Arizona 85205. Picture in your mind soaring, tan mesas crowned by multi-storied adobe villages; listen to the wind rustling the dried leaves of blue and red and yellow corn that grows in traditional gardens scraped from the dry earth. Do the names Old Oraibi, Hotevilla, Shongopavi and Walpi conjure up images of dancing Katsinam, pottery the color of the earth and overlaid silver with stark designs in black? Are you ready for a journey back in time to one of the oldest continuously inhabited settlements in the U.S.? Then join us this spring as we travel to the land of the Hopi where culture and tradition are rooted in the land. All along the way we will enjoy the company of Southwest scholar and second-generation Indian art dealer Mark Bahti. With his lifelong connections, Mark will introduce us to silversmiths, potters, basket weavers and katsinam carvers working in both historical and contemporary ways who will share with us their art, their lives and their rich cultural heritage — jeweler, Weaver Selina and his wife, Alberta, maker of coiled baskets; glass artist, silversmith and poet, Ramson Lomatewama and his basket weaver (plaited) wife, Jessica; potter, Dolly Joe Navasie, known as White Swann; katsina-carver, Loren Honyouti; and, sand cast artist Gerald Lomaventema. And, we’ve planned this departure over the Mother’s Day weekend to improve our chances of witnessing the very special celebrations that may be taking place in many of the villages. As with any cultural immersion experience, itineraries may change while unexpected and serendipitous opportunities arise. Mother’s Day itself will end with dinner in the Turquoise Room at La Posada, the perfect ending to a perfect travel ed-venture. We will explore two of the most significant archeological sites in the United States: Chaco Canyon and Mesa Verde. 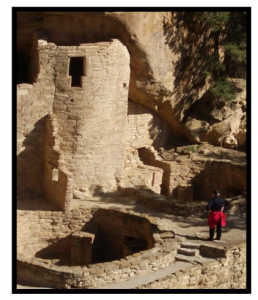 Guided by Fred Nials, world class geologist, Native American historian, and authority in the fields of archaeology and anthropology, we will spend two days at Mesa Verde and a day at Chaco Canyon. 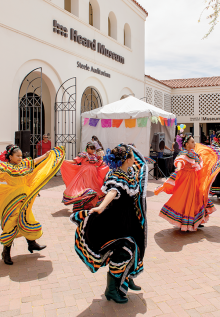 Join the Heard Museum as we celebrate the youth with, Children’s Day, Día del Niño, a day-long program with music, food, family activities, Folklorico performances, music in the courtyard, and so much more! FREE admission to the museum for children 12 and under with up to two accompanying parents or guardians! Bring the entire family out for a day of fun, arts, storytelling, music, dance, food, and activities for kids of all ages! Enjoy Art Activities, Music & Dance, Food….Details HERE. Grand Procession celebrates an exceptional collection of dolls, also known as soft sculptures, created by Jamie Okuma (Luiseño and Shoshone-Bannock), Rhonda Holy Bear (Cheyenne River Sioux and Lakota) and three generations of Growing Thunder family members; Joyce Growing Thunder, Juanita Growing Thunder Fogarty and Jessica Growing Thunder (Assiniboine and Sioux). 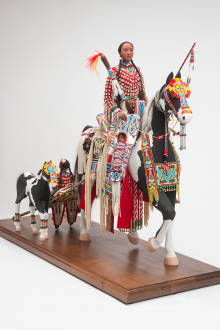 The dolls provide a figurative reference to Indigenous peoples from the Great Plains and Great Basin regions who lived in those areas during the late nineteenth century. Holy Bear, Okuma and the three Growing Thunder family members embellish each doll with tiny micro-beads in intricate detail. The 23 dolls included in the exhibition represent the largest private collection of its kind. Looking for enrichment, creativity, and fun? Join the Heard Museum on May 11 for the continuing 2nd Saturday Series. This month we will host, Books| Beats | Bites: food, music, and interesting titles. Come and browse the many selections of cookbooks, children’s books, American Indian genre, Southwestern-themed novels, and many other tables throughout the marketplace. We will be joined by artist, Steven Paul Judd (Kiowa/Choctaw.) 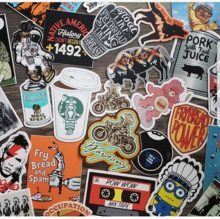 He will host a maker space to create stickers for your own sticker book. Also, try out a new delicious Native foods dish from our tasting table. Authors, Laura Tohe, and Evangeline Parsons Yazzie will be on-site with their wonderful books. Join Wasted Ink Zine Distro, and make and take your very own zine and express yourself during the open-mic session with authors and poets at 1 p.m.
Catch our continual Scene and Heard Film Series, for a showing of Taqwacore, Recommended for mature audiences, at 11:30 a.m. If you are not able to attend the curator walk-throughs or would like to review the exhibit with a small group of guides, plan to attend one or more of the makeup/supplemental walk-throughs led by Marlene Scholsohn, Pat Kilburn and Linda Hefter. Here’s the schedule for the Color Riot Makeup/Supplemental Walk-Throughs…Please register in advance. Please note that the start time of the Apr. 27, walk-through with Linda has been changed from 10:30 to 11:30 a.m.
Tuesday, April 23 – 10 a.m. The curator walk-throughs for the Grand Procession are scheduled for 9:30 a.m. and 1:30 p.m. Friday, Apr. 26, starting in Monte Vista. Note: The Grand Procession exhibit will be on display for about one year. I’ll send the schedule for the Grand Procession makeup/supplemental walk-throughs later this week. Exhibit Resources: Josef Albers in Mexico is a traveling exhibit organized by the Guggenheim Museum in New York. Check out the Guggenheim website at https://www.guggenheim.org/ exhibition/josef-albers-in- mexico for an exhibit overview, a short video, audio guide, press coverage and very interesting blogs. And don’t forget to check out the resources on the Docent Cart in the Heard Library! 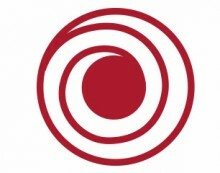 Contact Diane Leonte, Guild Communications at: communication@heardguild.org if you have a “Happening” that you want to share with Guild members. We would love to hear from you.